There is a thread on YouTube, 'Cooking With Dog'. Just type that in the search and you will get quite a few authentic recipes! Anyway, I was watching the one on ramen and had a thought, what if I could incorporate some of these with just plain-ol cup ramen?! Yeah, ok its probably not the healthiest thing to do, but sometimes you have to make due with what you have. - by this time your ramen should be done, so let it sit in the microwave till you are ready for it. - add 2 eggs and cook them for about 3 minutes. YOU WANT THEM TO BE SOFT BOILED... runny yokes. - you will want to let them cool for a minute or so.. but not too cool. - anyway, then you want to CAREFULLY cut each egg in half. You will want to turn the egg on the end quickly after its cut so the yoke doesn't come out. 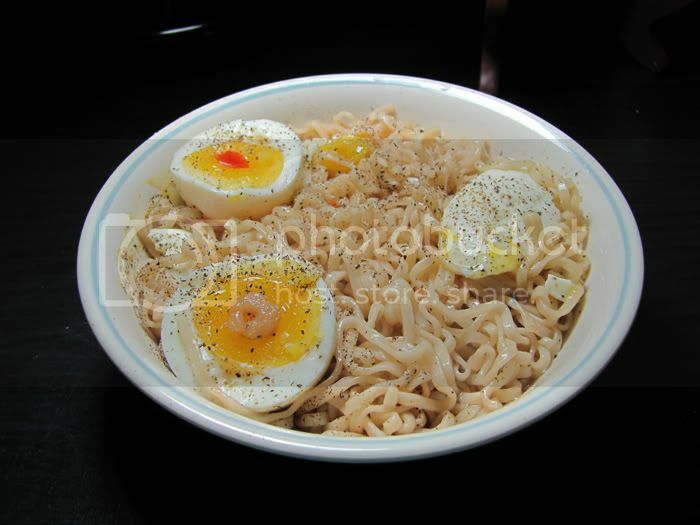 - finally, pour the ramen contents in a pretty bowl, add the eggs, and a little bit of pepper, and, VIOLA! *NOTE: IF you squish an egg, THATS OK! still put it in the Ramen. For this particular flavor of ramen (Shrimp with Lime) the taste of the yoke REALLY adds an amazing touch. That does look yummy. You know the main trick to easy-to-peel eggs? You need elderly eggs. Holding them under the water helps with a borderline egg, but won't make a jot of difference to a really fresh one. Keep your freshest eggs for poaching (the whites stay together) and use the oldest ones for boiling.